Chitose City ( 千歳市 ) is located in the southwestern part of Japan's Hokkaido Island and is probably most well known as a gateway to Hokkaido with its Shin-Chitose International Airport ( 新千歳空港 ). It is about 40km form Sapporo which is the biggest city in Hokkaido. Co-located with the Shin-Chitose International Airport is the Japan Air Self Defense Force's ( JASDF 航空自衛隊 kokujietai ) Chitose Air Base. 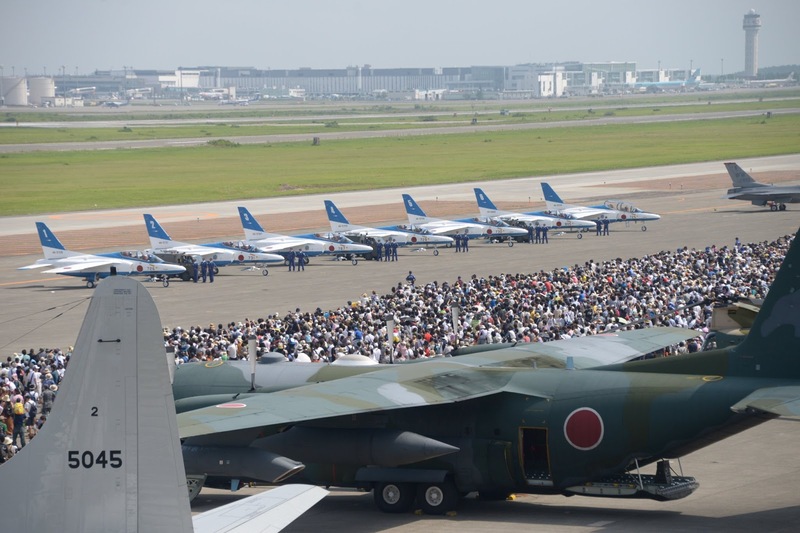 Such arrangements with military air base and civilian airport side by side is apparently quite common in Japan, as we have previously seen in Naha, Okinawa. 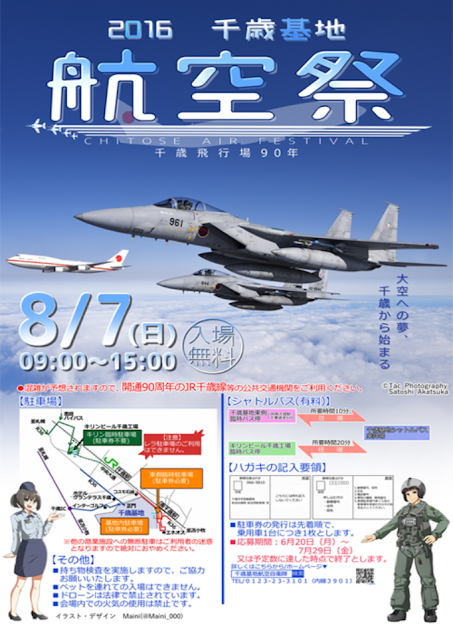 Every summer, the Chitose Air Base will have an Air Festival where the grounds will be open for the public and aircrafts and equipment displayed. There will also be flight demonstrations, helicopter rides, fun, food and entertainment. Of course businesses will be quick to churn out souvenirs and memorabilia of all sorts to commemorate the event. 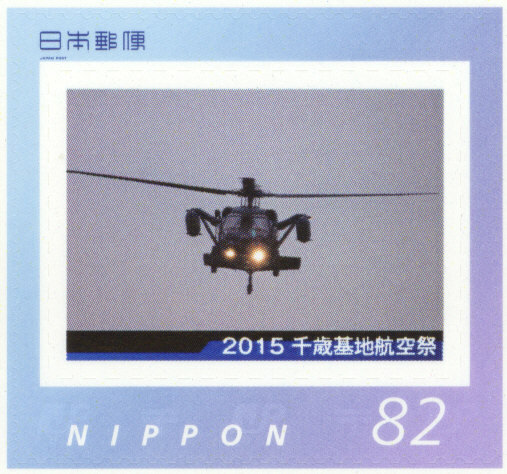 In this aspect, Japan Post is no exception and there was a special limited edition stamp issue last year, and the year before, just for that. 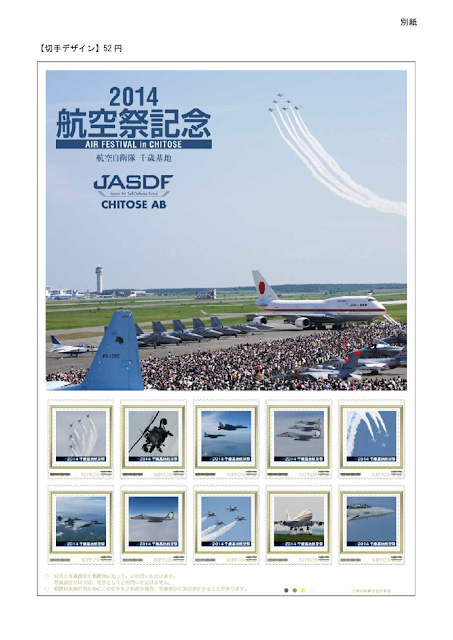 As it turned out, I was in Chitose earlier this month for the 36th Chitose JAL International Marathon. 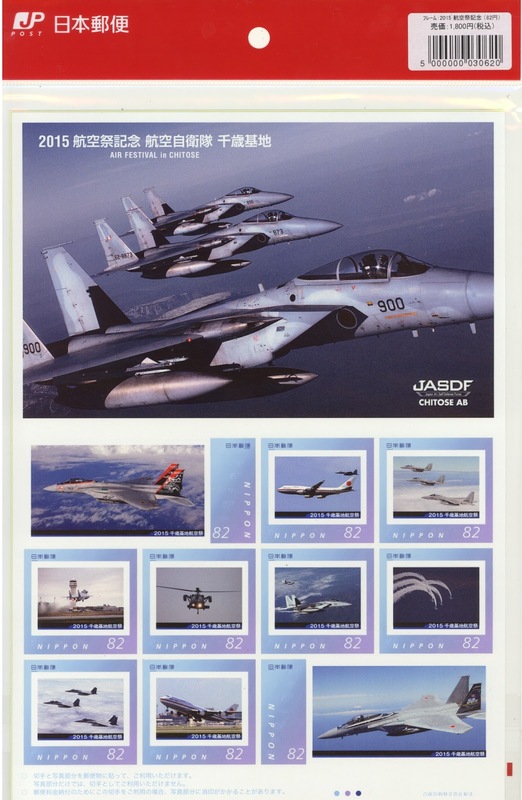 Shortly after landing at Chitose Airport, I happened to drive past a small post office not far from the main entrance of the North Chitose Garrison of the Japan Ground Self Defense Force and decided to check it out. Imagine my delight when I discovered that there were 4 complete sets of the limited edition Chitose Air Festival 2015 stamp sheetlet for sale. I vaguely remembered that I had wanted to order this item online from Japan Post last year when it was issued but failed to do so because it was sold out in a matter of days! I grabbed all four. 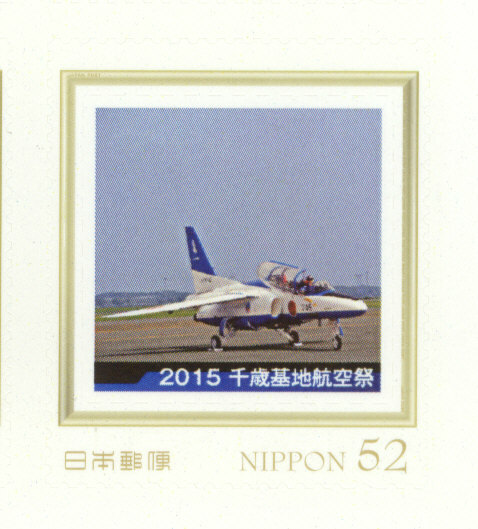 In any case, this special stamp set comprising of 2 separate sheetlets of ten ¥82 and ¥52 stamps respectively was issued on 15th July 2015. Only a total of 1300 sheetlets of each denomination was released, making it a limited edition. 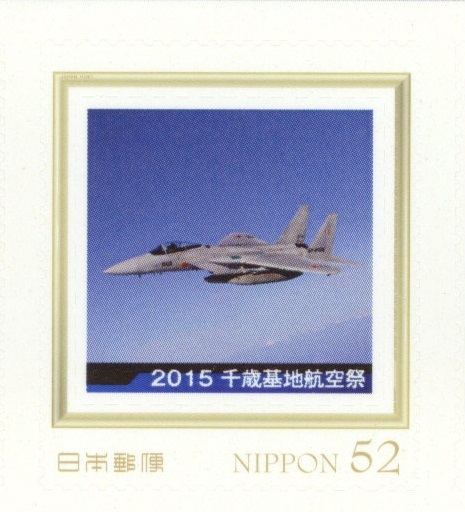 They were available from 38 post offices in cities around the air base including Chitose, Eniwa, Kita-Hiroshima, Sapporo and Otaru. 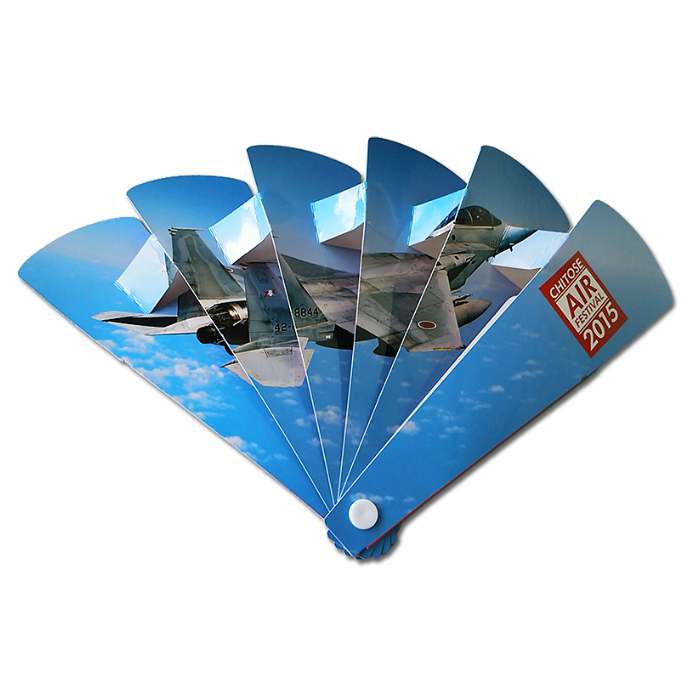 The ¥52 sheetlet came bundled with a big B5 sized postcard and a folding paper fan while the ¥82 sheetlet had a sheet of stickers depicting the various aircrafts of the air base. 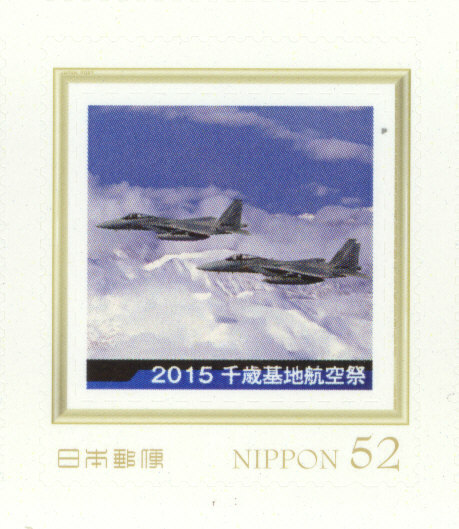 Both sell for ¥1800 each, or about USD17.00 at today's exchange rates, consumption tax included, which was way above their face value, just like the JGSDF Kamifurano Garrison stamp issue. 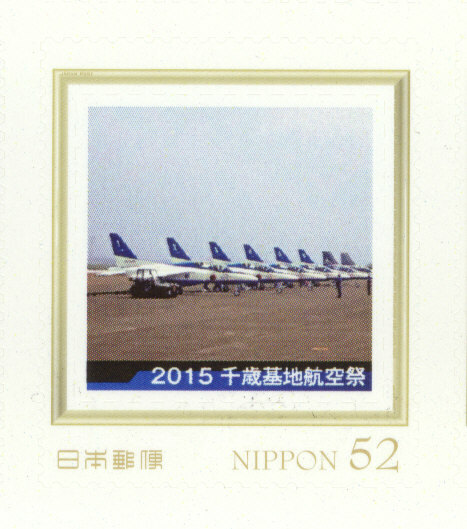 The ¥52 sheetlet of 10 sticker stamps. The folding paper fan bundled with the ¥52 sheetlet. 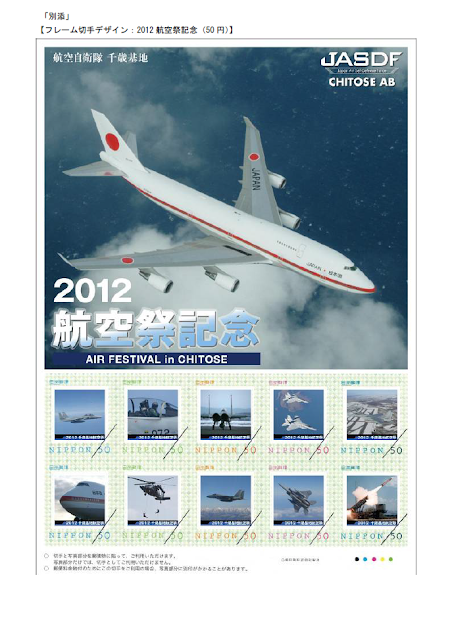 The ¥82 sheetlet of 10 sticker stamps. 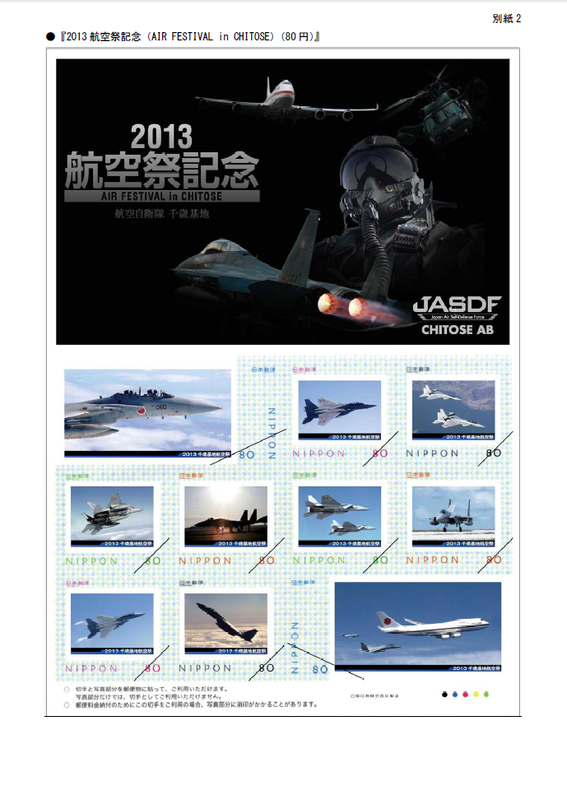 as well as JASDF 60th anniversary paint schemes. 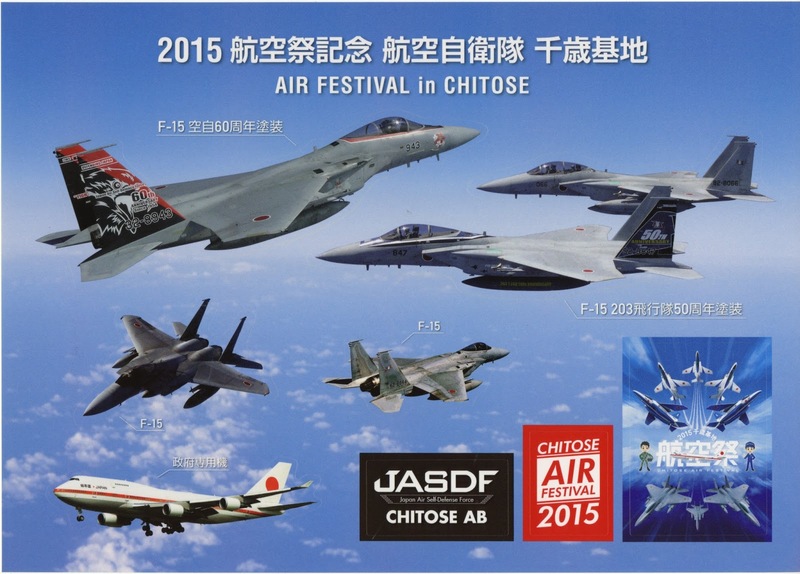 Chitose Air Base ( 千歳基地 Chitose Kichi ) is JASDF's northern-most major air base. 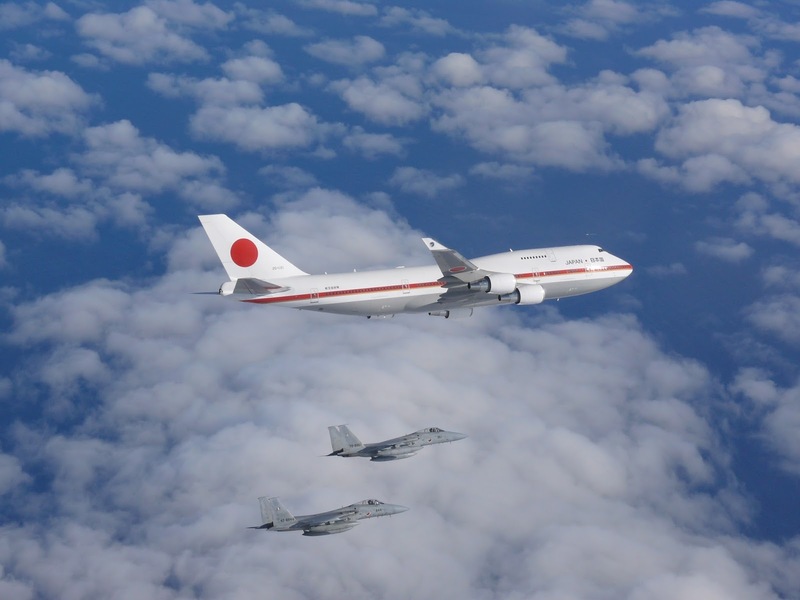 It is tasked to monitor and protect Japan's maritime border with Russia. It started out as a airfield built from a ten hectare plot of land donated by the villagers of Chitose and had its first flight in 1926. In 1934 the landing strip was extended and by 1937 it was taken over by the Imperial Japanese Navy. 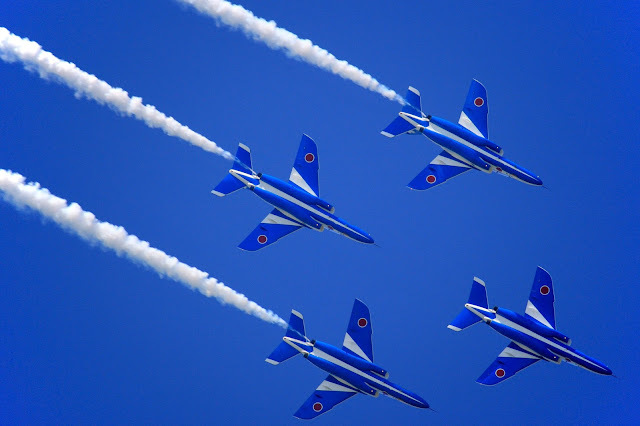 After the end of World War II was taken over by the United States Army Air Force and later the United States Air Force. 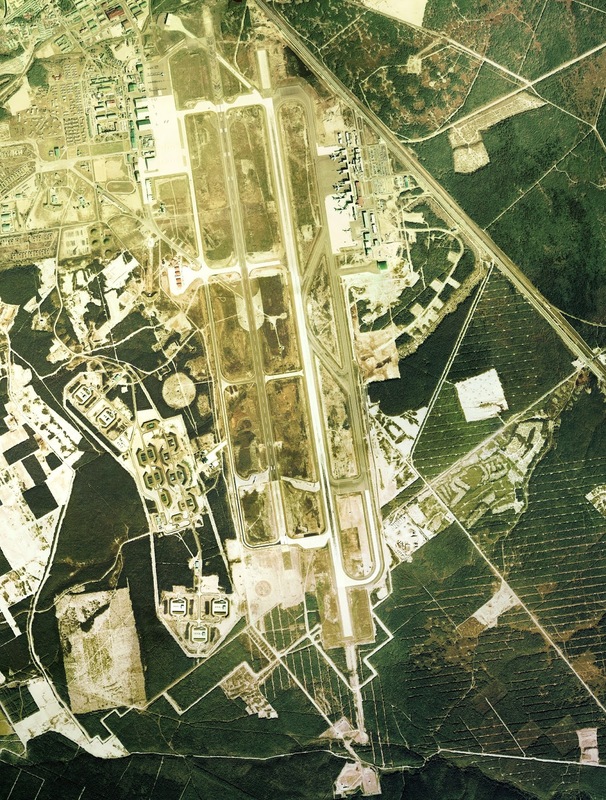 It was used mainly as a logistics and maintenance facility in the years leading to the Korean War, and then as an emergency landing field for aircraft returning from combat missions in Korea. It was also around that time ( 1951 ) when it started the first scheduled civilian flights to Tokyo, operated by Japan Airlines. 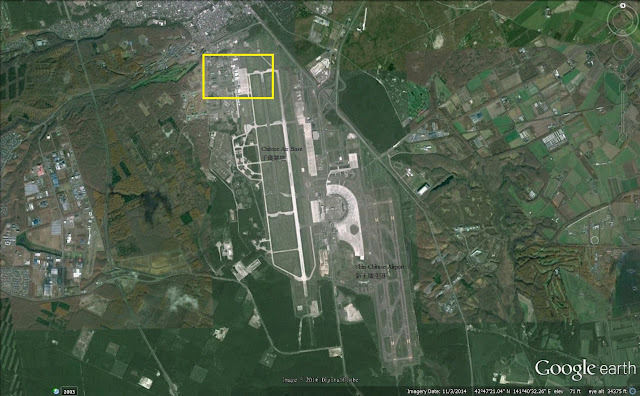 So in effect the air base served a dual purpose as a civilian airport as well. 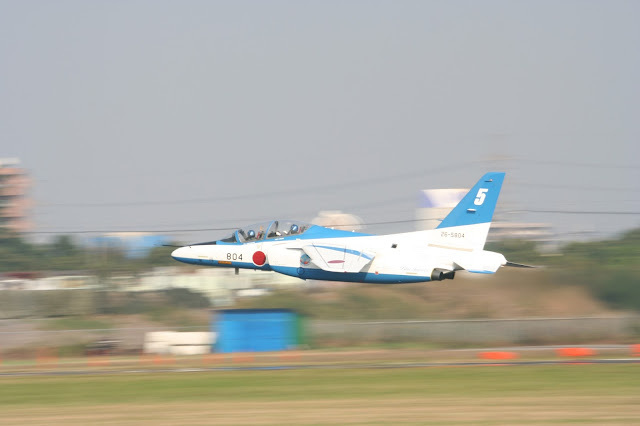 The USAF returned the facility to Japanese control in 1957 and the newly formed JASDF wasted no time in transferring its 2nd Air Wing with its F-86F from Hamamatsu Air Base to Chitose that same year. By 1963 a passenger terminal was built and immigration facilities were added in 1972, just in time for the Sapporo Winter Olympics. In 1974, the 2nd Air Wing had its F-86Fs replaced by the then state of the art F-4EJ Phantom. 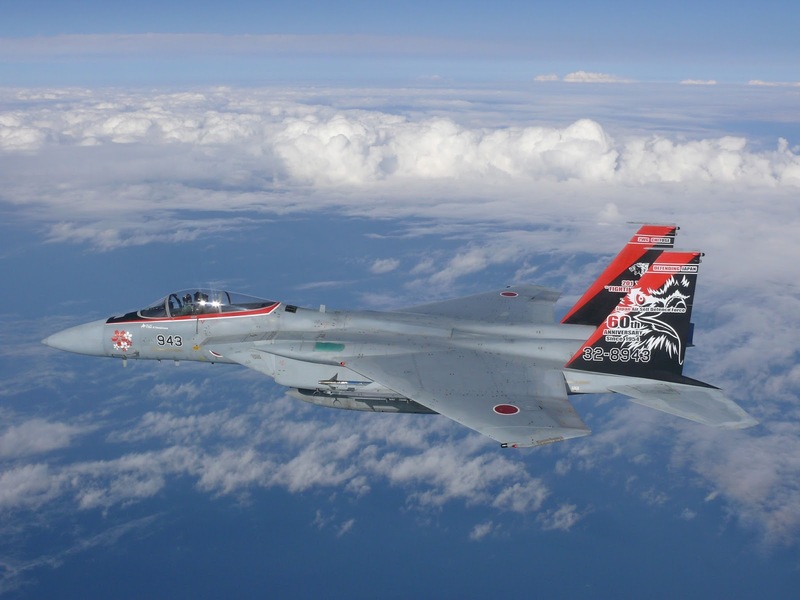 The Phantoms were eventually transferred to Okinawa in 1985, after Chitose began receiving the F-15J as their replacement. Chitose Airbase was the original intended destination of the Soviet MiG-25 fighter pilot Viktor Belenko during his daring defection to Japan on 6th Sep 1976 forty years ago. He missed Chitose due to poor weather ( poor visibility ) and shortage of fuel and ended up landing at the civilian airport at Hakodate. 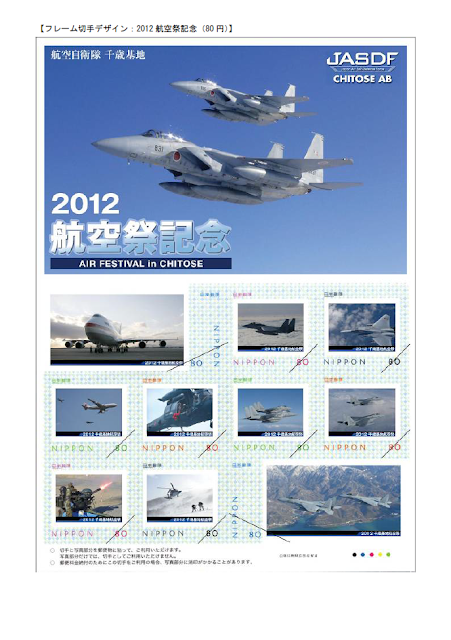 You can read about the entire MiG-25 incident here. 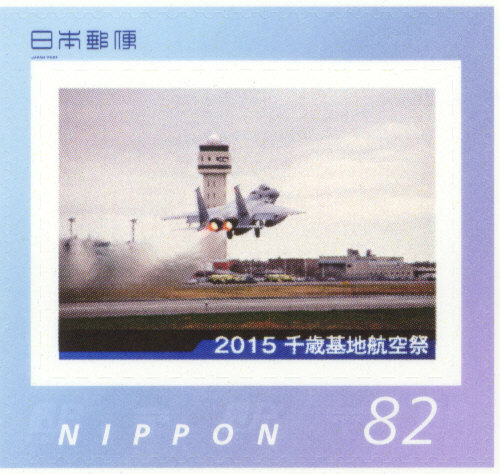 In 1988, the construction of the Shin Chitose Airport was completed and the civilian air traffic was channeled to its dedicated runway. By 1996, a second runway was added and military and civilian traffic were completely segregated, each with their own runways but sharing the same air traffic control. Chitose Air Base and Shin Chitose Airport ( New Chitose airport ) in 2009. Enlarged from above image. 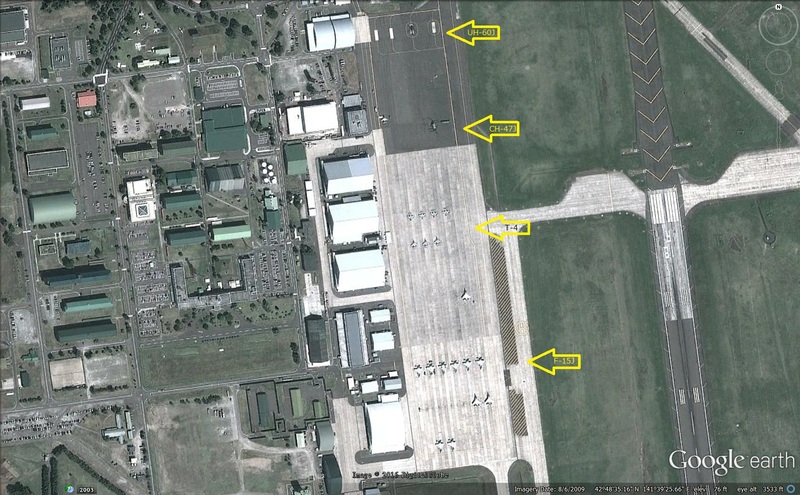 UH-60J, CH-47J, T-4 and F-15J clearly identifiable. Today, Chitose Air Base is home to the JASDF's Northern Air Defense Force's 2nd Air Wing comprising of the 201st and 203rd Tactical Fighter Squadrons ( F-15J and T-4 ), the 3rd Air Defense Missile Group comprising of the 9th and 10th Missile Battalion ( Patriot PAC-3 ), the Special Airlift Group with its 701st Squadron ( Boeing 747-400 ) and the Chitose Air Rescue Squadron ( U-125A and UH-60J ) together with all their support and maintenance units. 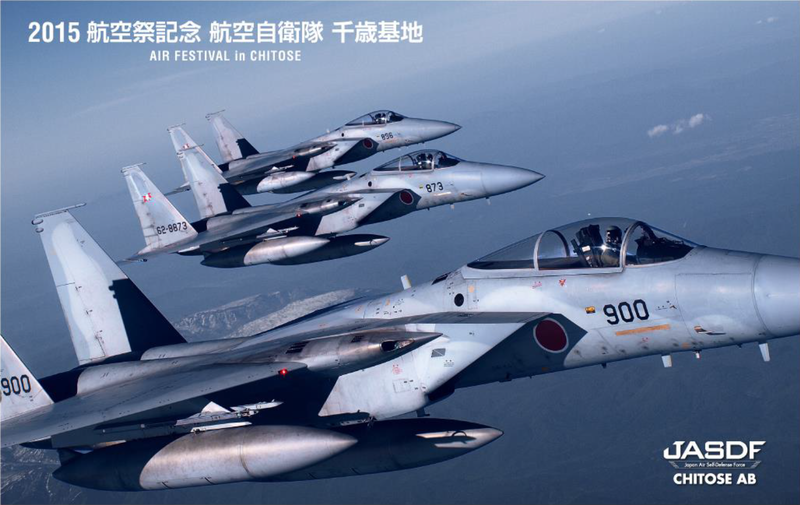 You can watch the excellent JASDF video below ( in Japanese ) about Chitose Air base to learn about its units and operations. 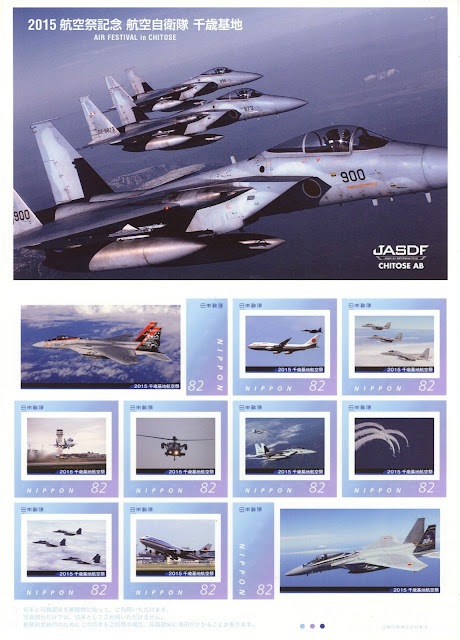 The Mitsubishi F-15J and the twin seat F-15DJ are currently the most numerous and capable frontline multi-role fighter of the JASDF. They have been in service since 1984, replacing the Lockheed F-104 Starfighter. Already being selected as Japan's next generation fighter in 1975, their acquisition was accelerated by the sudden realization of a serious air defense capability gap when on 6th Sep 1976, a defecting Soviet MiG-25P Foxbat intruded into Japanese air space over Hokkaido and landed at Hakodate Airport without being intercepted by the Japanese fighters ( 2 x F-4EJ Phantoms, 302nd TFS ) scrambled from Chitose Air Base. 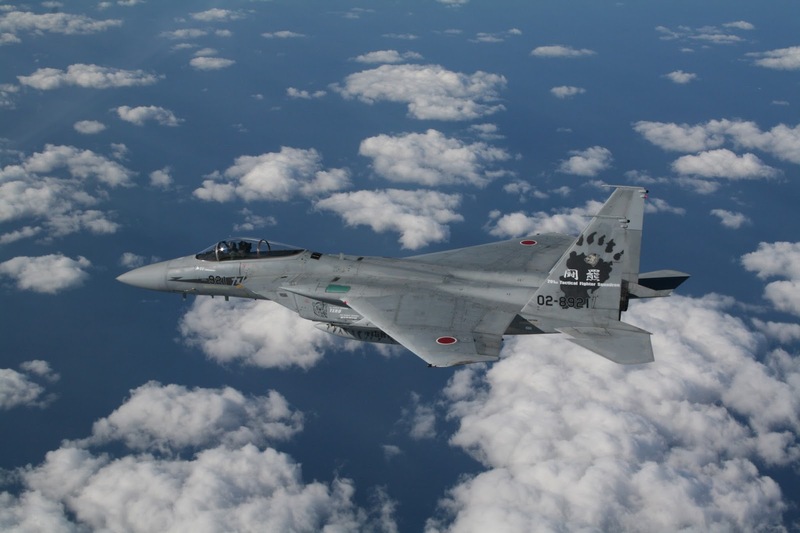 The F-15J and the twin seat DJ version will eventually be replaced by Japan's next generation fighter, presumably known as the F-3, by the end of next decade. 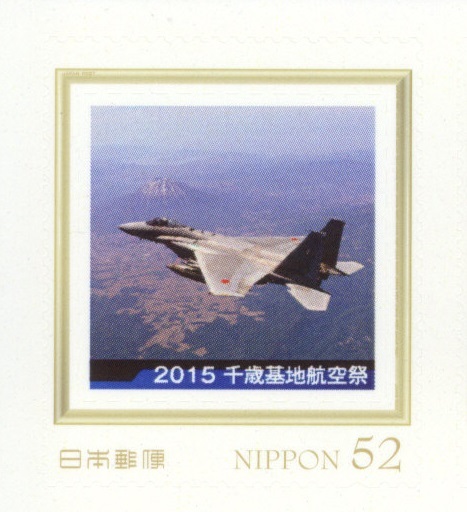 F-15J of the 201st TFS with JASDF 60th anniversary colours. F-15J of the 201st Tactical Fighter Squadron with JASDF 60th anniversary paint scheme. 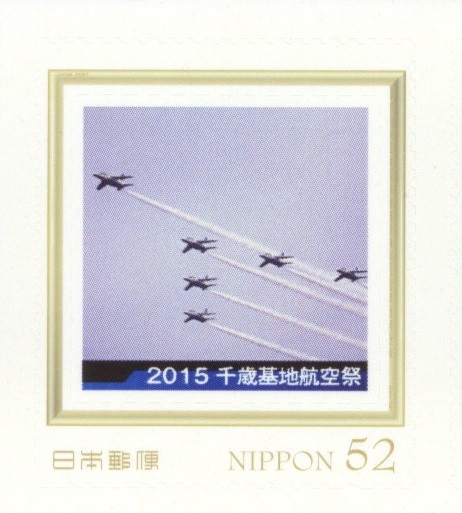 This exact photo was used for the stamp design shown above. 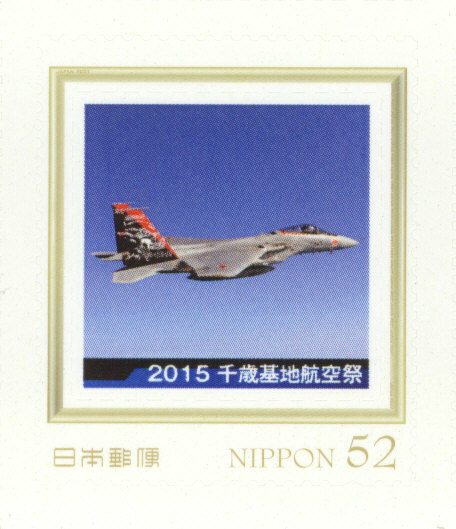 F-15J of the 201st TFS with JASDF 60th anniversary paint scheme. 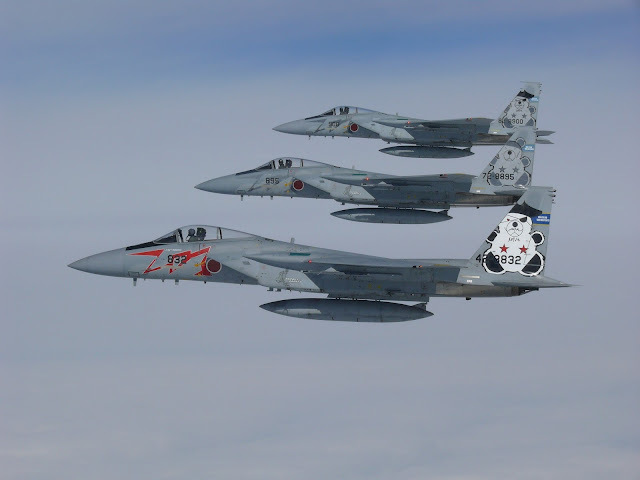 203rd Tactical Fighter Squadron 50th anniversary paint scheme. 2 F-15J over snowy mountains. 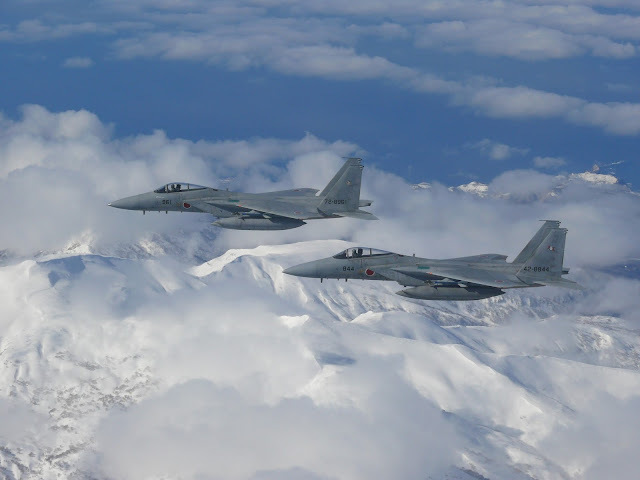 2 F-15J from the 201st and 203rd TFS over snowy mountains. 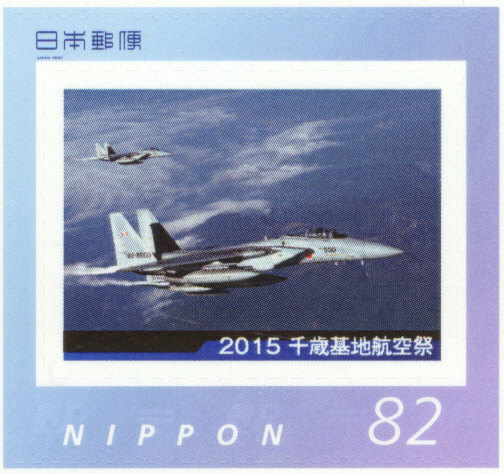 This photo was used in the stamp design shown above. 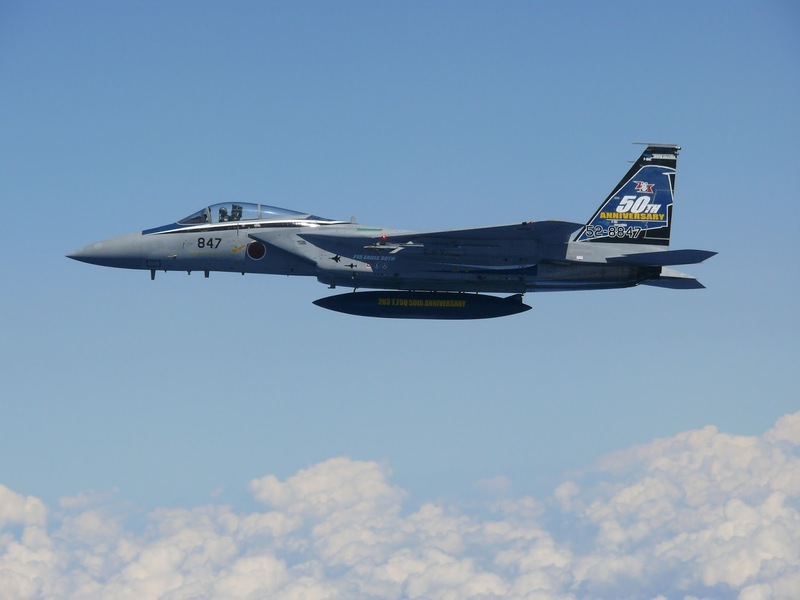 F-15J of the 203rd Tactical Fighter Squadron. 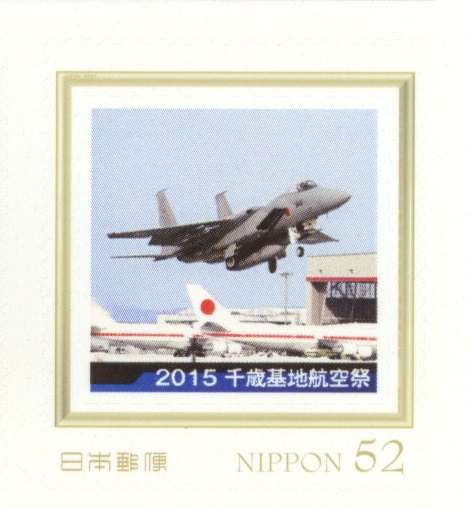 F-15J of the 201st Tactical Fighter Squadron " Fighting Bears " ( 闘羆 tatakae higuma ). The decision to acquire two Boeing 747-400 special transport for the Japanese Government were made in 1987 and the aircrafts were delivered in late 1991. 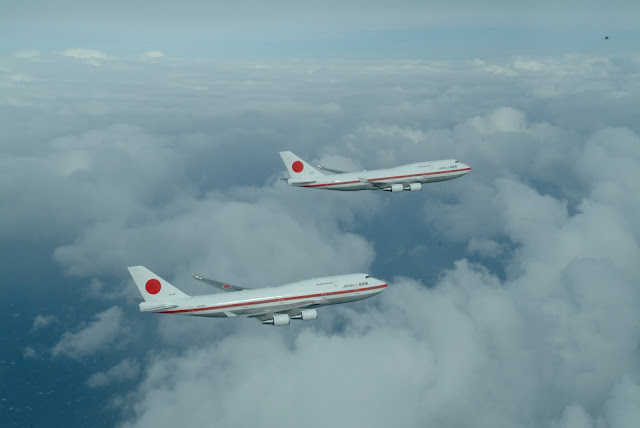 Initially registered as civilian aircrafts under the jurisdiction of the Prime Minister's Office, these Jumbo Jets were transferred to the Japanese Defense Agency ( now Ministry of Defense ) in 1993. 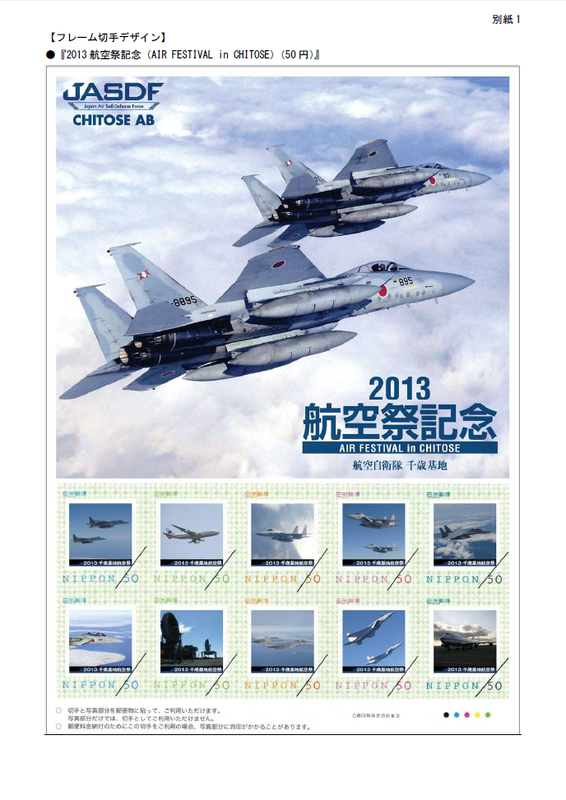 They form the 701st Squadron of the Special Airlift Group ( 特別航空輸送隊 Tokubetsu Kokuyusotai ) which is based in Chitose Air Base. 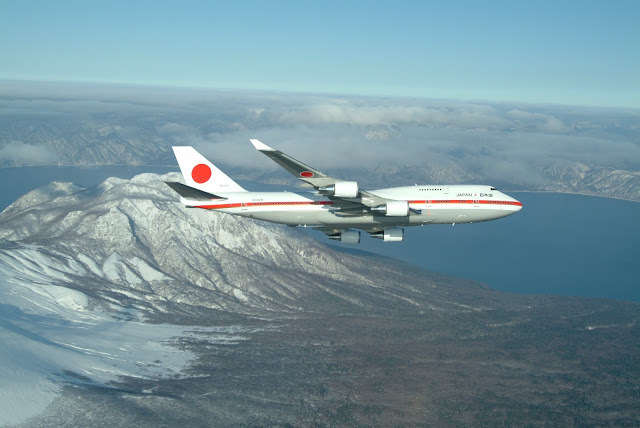 They are mainly used for transporting members of the Japanese Royal Family and ministers of the Japanese Government while they are on official duties, as well as for ferrying visiting foreign dignitaries. 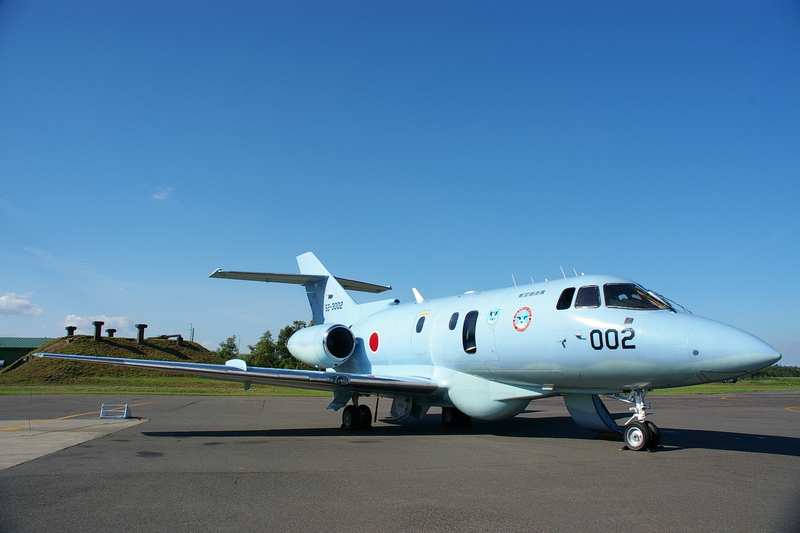 They are also used for flying SDF personnel on peacekeeping missions, evacuating overseas Japanese citizens during times of crisis and occasionally for transporting refugees of other nations during conflicts elsewhere in the world. 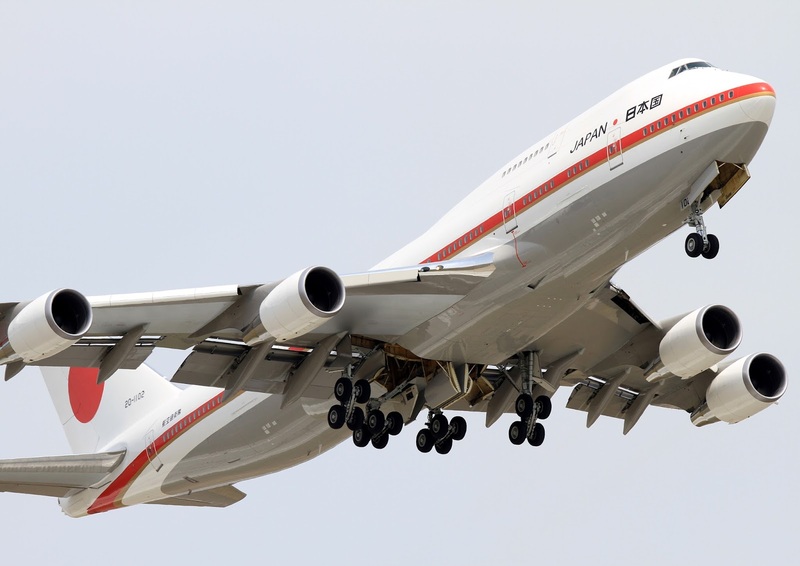 The venerable Boeing 747 is a design that dates back to the sixties and is no longer in production. These ageing transports are slated for retirement in 2019, so they will not be around for much longer. 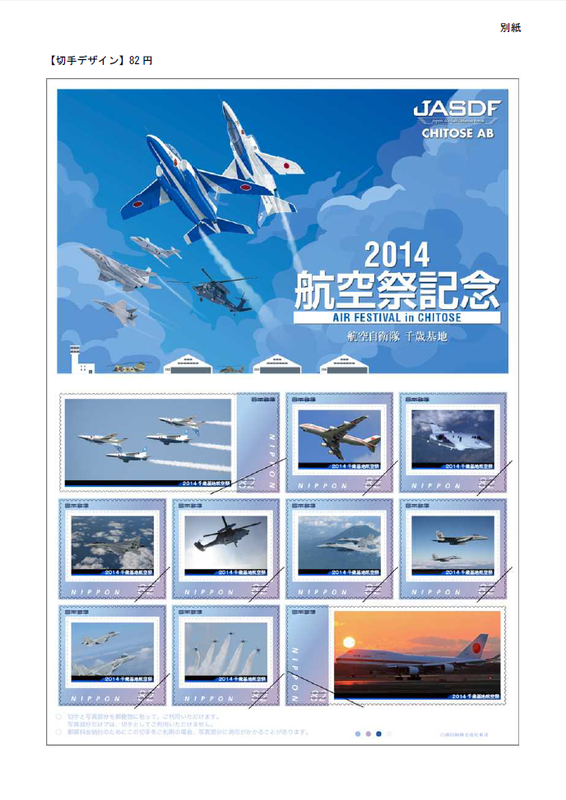 The Special Airlift Group's headquarters is in Chitose Air Base. Boeing 747-400 VIP transport with F-15J. Boeing 747-400 VIP transport taking off. 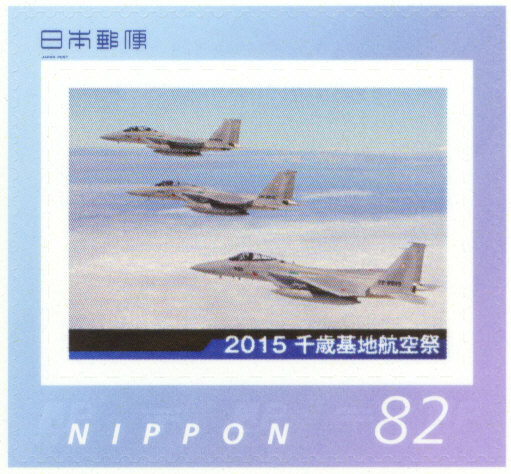 F-15J was used in the stamp design shown above. mission and the second as spare. Photo JASDF SAG. 701st Squadron emblem depicting Cygnus, the constellation of the the Swan. The JASDF has 4 Boeing KC-767J Multi Role Tanker Transport ( MRTT ) with the 404th Tactical Airlift Tanker Squadron based at Komaki Air Base in Aichi Prefecture. They are the military derivative of the Boeing 767-200ER airliner and has a tail boom for fuel transfer. It was based on the shorter 767-200ER as there was concern with the boom striking the ground during take off and landing if the 767-300 with a longer fuselage was used. As its name implies, it can be used as a transport for personnel and cargo or as an aerial tanker. JASDF actually has another derivative of the Boeing 767, the E-767J Airborne Early Warning And Control ( AWACS ), under the 602nd Squadron based in Hamamatsu Air Base in Shizuoka Prefecture. 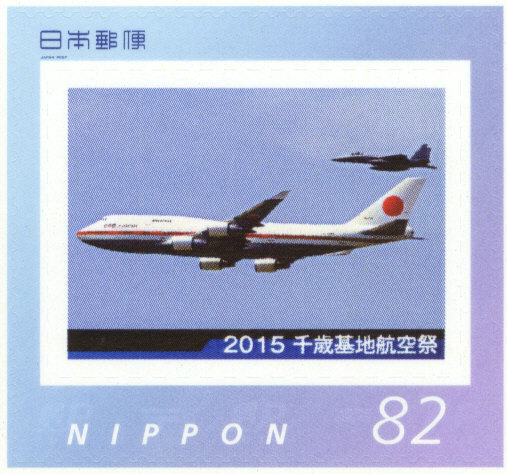 The aircraft depicted in the stamp lacks a rotating radar dome on its upper fuselage and is therefore not likely the be the E-767 but is the KC-767J instead. 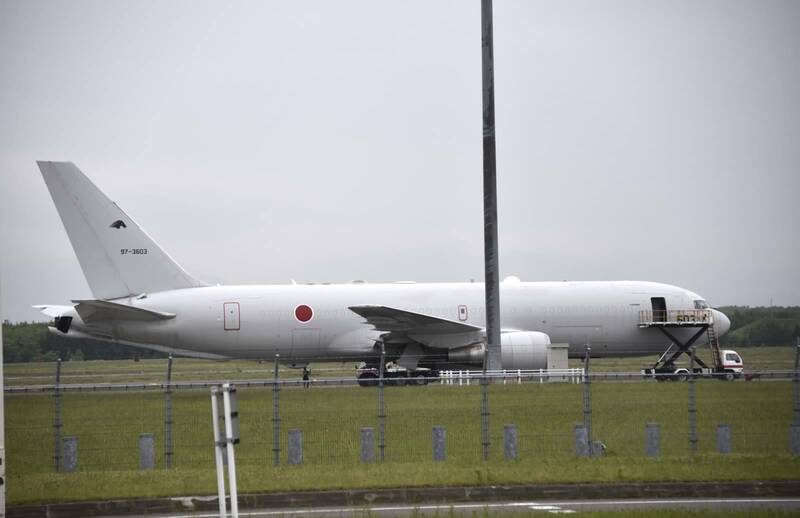 I suspect the KC-767J is routinely deployed to Chitose because I happened to photograph one sitting inside the air base shortly after I arrived at Shin Chitose Airport, while being ferried to the car rental outlet. 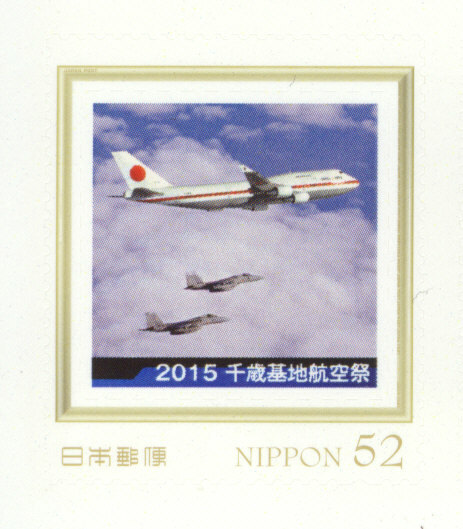 Likely the KC-767J at the Air Festival in this low resolution image of the stamp. 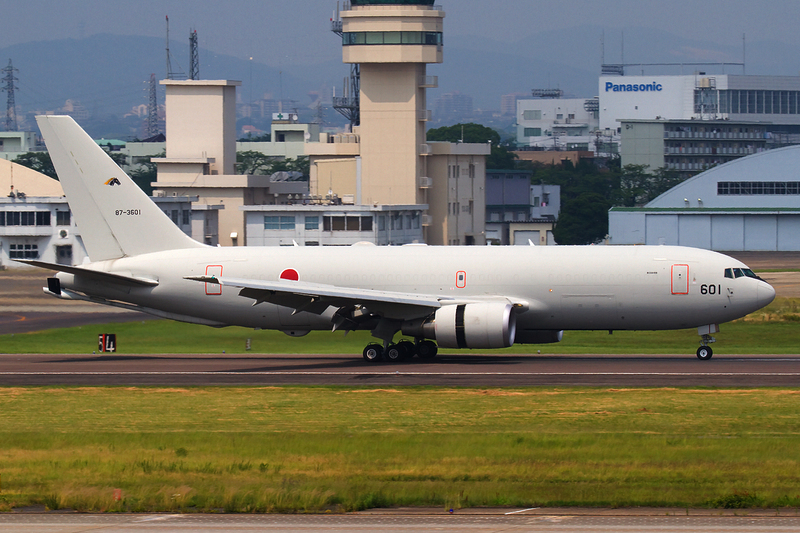 KC-767J 97-3603 photo taken from motorway at the perimeter of Chitose Air Base 3rd Jun 2016. The Chitose Air Rescue Squadron ( 航空救難隊 Koku Kyunantai ) operates 2 types of aircraft. The fixed-wing U-125A search aircraft ( 救難捜索機 ) which is a derivative of the British Aerospace 125, a twin-engine mid-size corporate jet and the Mitsubishi UH-60J Blackhawk Search and Rescue helicopter ( 救助機 ). The SAR squadron is responsible for locating and saving victims of air crash accidents and they also help out with large scale disaster relief operations, mountaineering accidents and sea rescues. 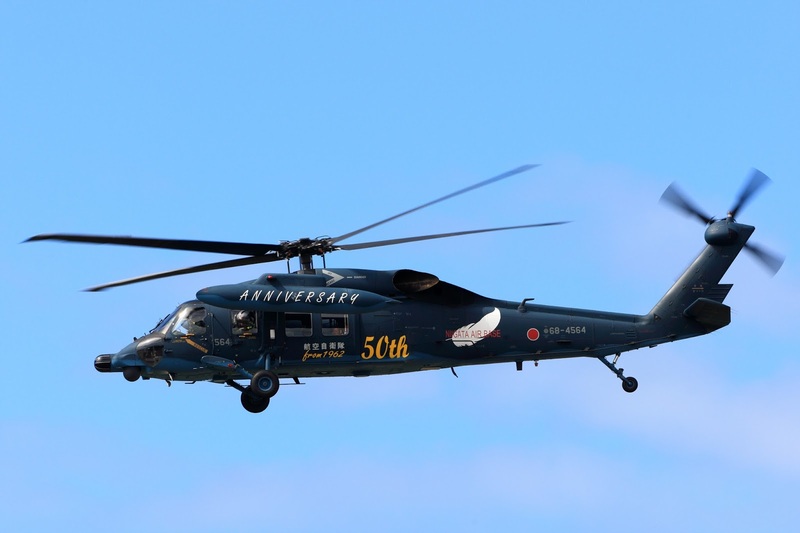 Mitsubishi UH-60J of the Chitose Air Rescue Squadron. 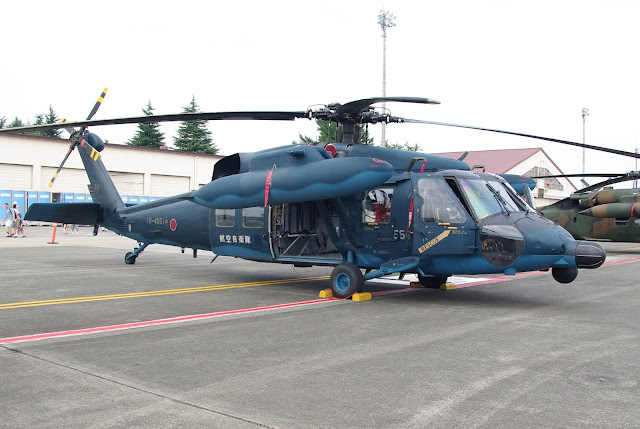 Hyakuri Air Rescue Squadron seen with external fuel tanks. The Blue Impulse is JASDF's flight demonstration team with a history tracing back to 1960. Then the first generation aircraft used was the North American F-86F Sabre, followed by the Mitsubishi T-2 from 1980 and finally the Kawasaki T-4 Intermediate Jet Trainer ( 中等練習機 ) from 1995. 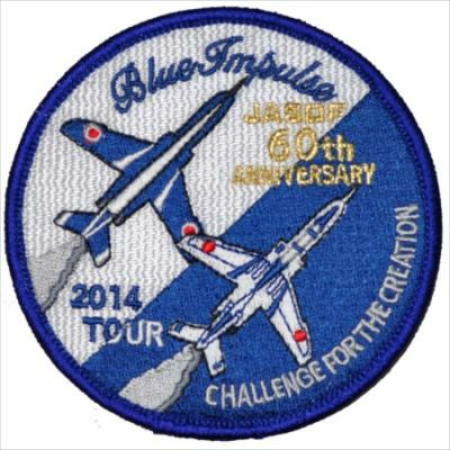 The Blue Impulse aerobatics team of the 11th Squadron are not indigenous to Chitose but are based in Matsushima Air Base. 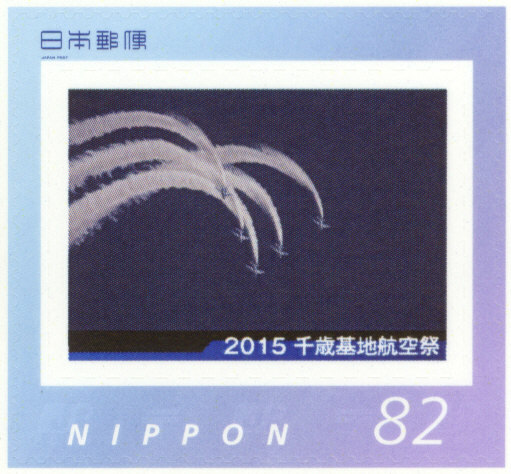 They are at Chitose to perform their aerial stunts during the Air Festival and are therefore included in the stamp design. 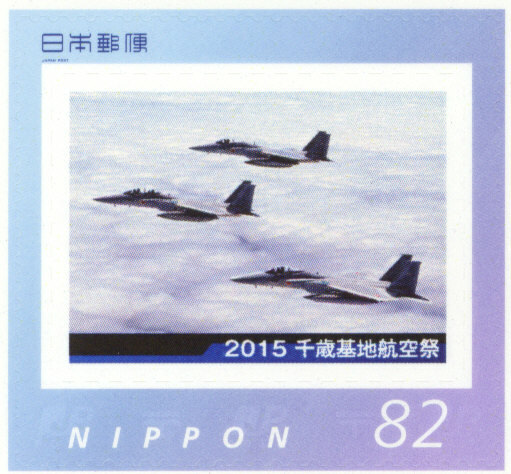 However, the 201st and 203rd Tactical Fighter Squadrons are composite units with F-15J/DJ fighters and T-4 trainers and it is not uncommon to see these T-4 buzzing around the skies of Hokkaido. Just last October, I was exploring the Hell Valley of Noboribetsu Onsen which is near Chitose when a couple of T-4 overflew the resort town low enough for me to have a visual ID. The annual Chitose Air Festival ( 千歳基地航空祭 Chitose Kichi Koku Matsuri ) is a publicity event for the JASDF where it can showcase its equipment and capabilities. 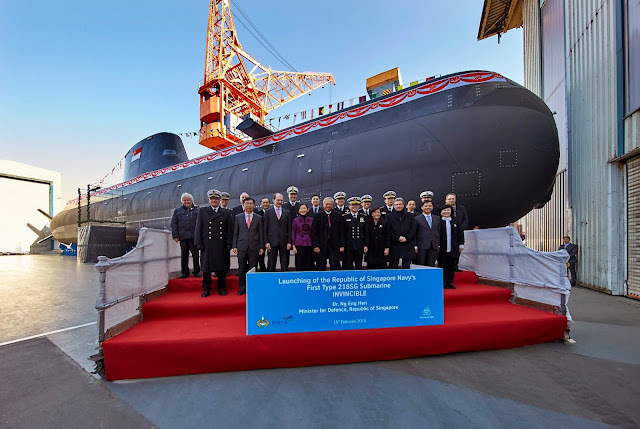 It is also probably an effective way to recruit new members for the Self Defense Force and might just inspire the next generation to join the military service when they grow up. The date of the Chitose Air Festival 2016 has been finalized : 7th Aug 2016. 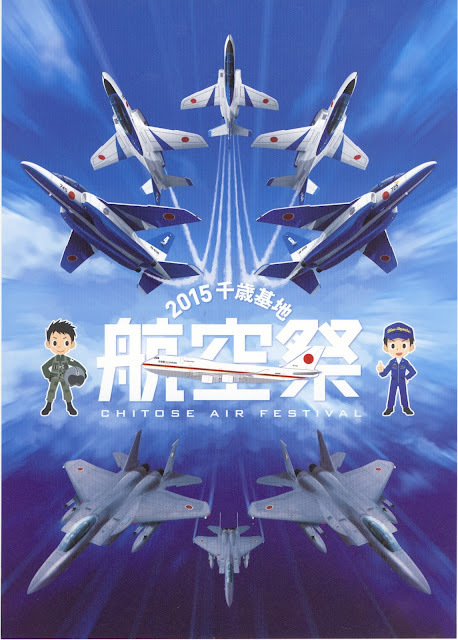 If you are in Hokkaido this August, why not consider visiting the Chitose Air Festival 2016? It will be held on 7th Aug and admission is free. How to get there? If you are arriving at Shin-Chitose Airport, you are already there! 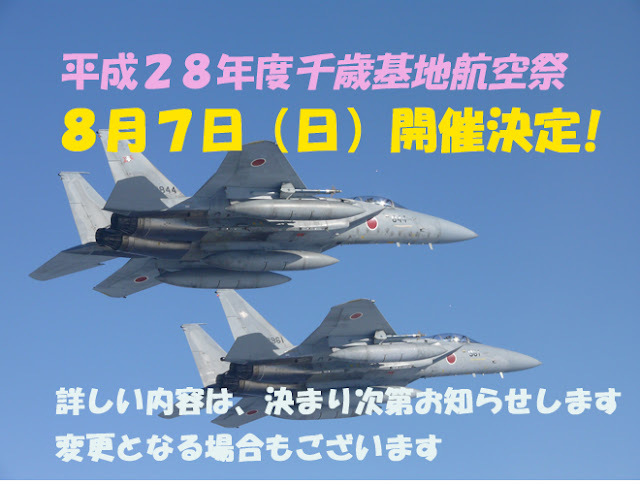 Go to the Airport's train terminal, the JR Minami-Chitose Station and there will be a temporary shuttle bus stop less than 5 minutes walk away with buses to bring you to the Air Base ( 10 min ¥210 ) from 7am to 1:30pm. Return trips from the Chitose Air Base to the train station starts from 1:30pm until 4:30pm. 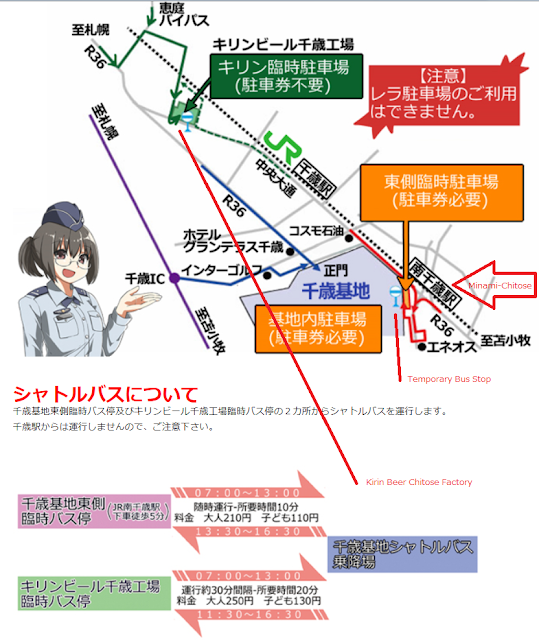 From Sapporo, take the rapid train service towards Chitose Airport from JR Sapporo Station to the JR Minami-Chitose Station ( 30 min, ¥840 non-reserved seats, ¥1140 reserved seats ) and similarly walk to the same temporary bus stop ( see image below ). If you drive or rent a vehicle, park at the Kirin Beer Factory and take the shuttle service from the car park ( green label in the map below ). Kirin Beer has a huge car park for visitors and was also one of the designated parking areas for the Chitose JAL International Marathon. And while you are at it, keep a lookout for the corresponding special stamp issue for 2016 which I am quite certain will be released. Why am I so sure? 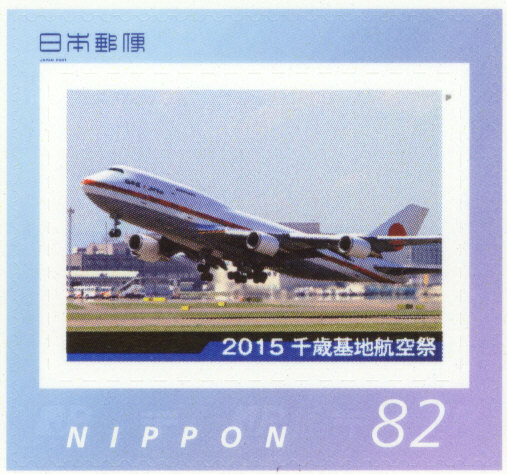 Because Japan Post has been doing this annually since 2012 ( see below ). 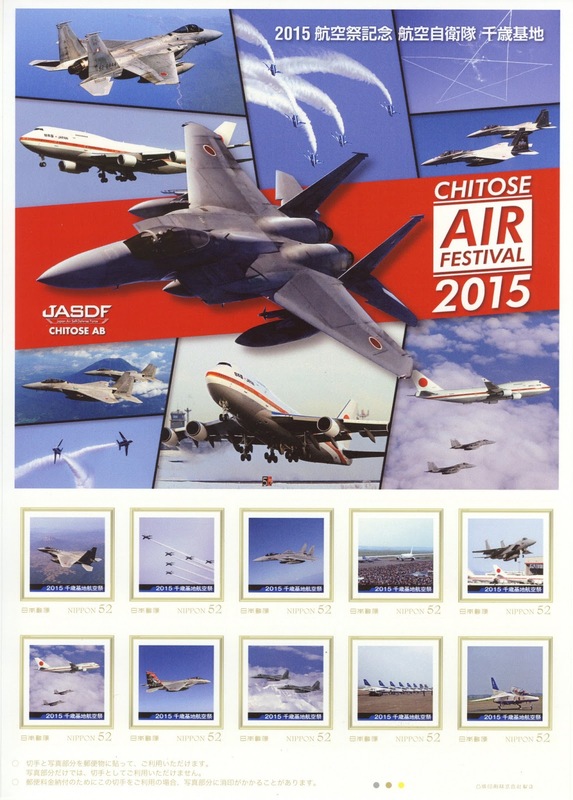 Already the 2015 ¥52 sheetlet which originally cost ¥1800 is now retailing for ¥2880 online. That's a 60% appreciation in less than a year, a benchmark which even the best fund manager would find difficult to beat! 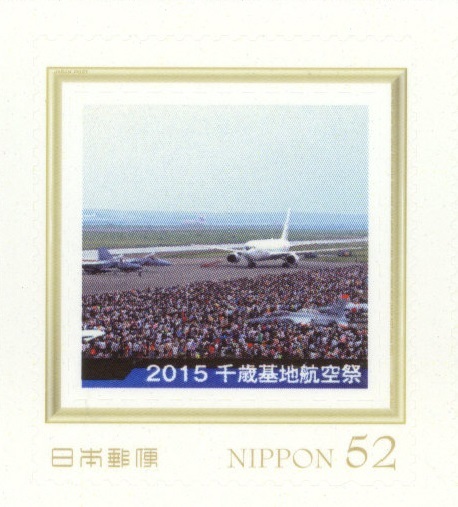 The 2015 stamp sheetlet in its retail packing.